Tom was born and raised in Bethel, Indiana, a town which no longer exists. Barb grew up in South Bend. They met at Ball State University, were married their senior year and have been a team for the past 45 years. They both have Bachelor Degrees from Ball State University and Masters Degrees from Wichita State University. Barb Owned and Directed her own Preschool when their children with small. Later she taught High School Deaf and Hard of Hearing, then Multiply Handicapped students at a Magnet High School, while Tom, a Speech Clinician, became a National Catastrophe Insurance Claims Team Manager, for a major insurance company. They lived in the Wichita, KS area for 30 years. Barb took art classes in college for Elementary Ed. Later, in folk art classes, learned to paint with Acrylics on wood. She discovered her hidden talents, a natural skill, and passion for painting and drawing. 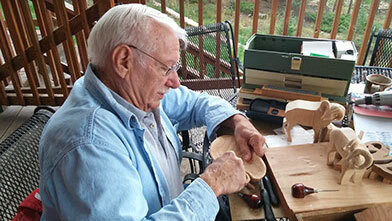 Tom took classes in wood sculpture from Ori Jones in Wichita, KS. He was instantly hooked. He has created realistic art pieces for the past 40 years. While raising a family and with encouragement from friend and family, Barb and Tom began collaborating to produce hand painted, Custom Hand Sculpted wildlife sculptures and paintings as commissions or gifts. They were invited to be in one of the main downtown Wichita Galleries, Gallery XII, but were unable to follow up on it, since Tom had started extensive travel across the country with his work and Barb developed Carpal Tunnel syndrome in both hands because of using sign language for the Deaf. Several surgeries later, she was again able to resume her painting. 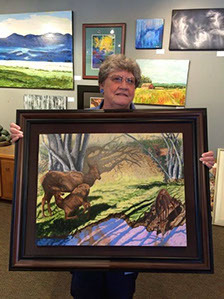 After teaching and managing a national catastrophe team and raising their kids, they retired and moved to Evergreen, CO. Then in 2011, with insistence from their kids, Barb began painting realistic wildlife paintings. Tom enjoys meticulous hand sculpting and creating delicate wildlife and animated replicas. Often the grains and knots in the wood are his inspiration. He patiently shapes a form from a wooden chuck into his vision of an animal at rest, a delicate flower, or a bird in flight. He enjoys forming each piece to his specifications and desires. Painting some of Tom's work often brings the pieces to life, other times Tom wants the wood grain to be an essential detail. They both use a 5X magnifier lamp to see and create each piece. Part of their enjoyment is they can be extremely detailed to create the fine quality they want in each piece. Being bird and animal lovers and a team for 45 years, they are continually surprised with the beauty of the surroundings in the mountains and forests of Evergreen, CO., a high foothills, mountain town, 30 minutes West of Denver.